A popular indicator for traders, Pivots signal a temporary change in direction of the price, and this is often seen as a pullback or a reversal of between three and seven bars. 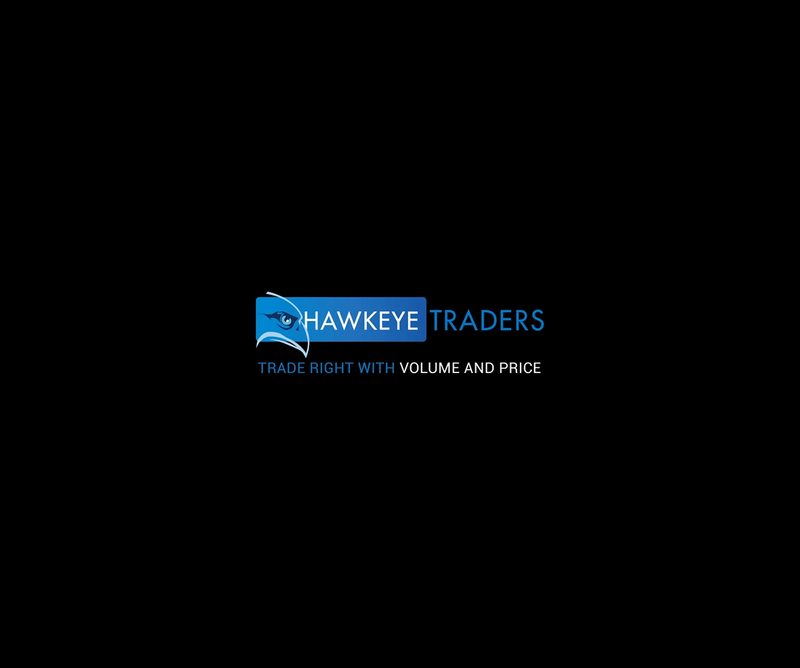 The advantage for Hawkeye traders is that these are generated automatically by the software giving you powerful advance signals of short term changes in trend, while also creating visual areas of price support, resistance and consolidation. The yellow dots are the pivots. They are formed automatically when there is either an isolated high or an isolated low. When this happens, there is an isolated high. The high is isolated because to its left and to its right there is empty space. As a general rule, when you see an isolated high, it suggests the market has reached a temporary peak, which means that for the next three, five or seven bars it is likely to continue lower. The isolated low occurs when the bar before has a higher high and a higher low, and the bar after also has a higher high and a higher low, leaving the pivot bar with empty space on either side of the low. Once again this means that you are likely to see a reversal in the market, this time to the upside and possibly moving between three and seven bars. 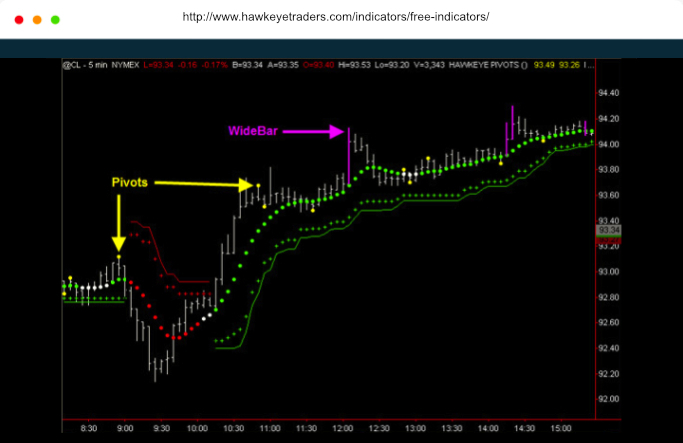 As you can see, pivots can be good ‘leading’ signals and are used by expert traders all over the world. If you are in an uptrend then a LOW pivot can simply confirm that the market is likely to continue in the same direction. If you are in a downtrend a HIGH pivot can indicate that the market is likely to continue to the downside. So they work very well to confirm trends. Markets move sideways just as much as they trend, and it is sideways movement where pivots become even more significant. If the market is simply drifting sideways, and Hawkeye will automatically tell you this with its Trend+Stops Indicator by painting the trend white, then Pivots will often signal the start of a new up or down trend. There are periods when the Forex market is not trending either higher or lower, but is simply moving sideways in a congestion or a consolidation phase. This is where the price action is restricted to a narrow range on the charts. During these periods, the extremes of this price action are marked by the Pivot indicator with a bright yellow dot, which clearly defines areas of potential support and resistance. Once one of these price levels is breached with a break and hold, either above or below these levels, it is clearly signaling a potential breakout from the range. This gives traders a great opportunity to enter the market on a low risk breakout as a new trend develops. This reveals the true power of the Pivot indicator. Pivot your way into profits! Sometimes the market moves very quickly in one direction. A market can suddenly strengthen or weaken which causes havoc for many traders. When this happens the bars that are created on the charts are called “wide bars,” and appear as a bar with a wide price spread on the timeframe you are trading. WideBar tells you when the market price exceeded a certain range twice average true range over a 20 bar period. Most traders jump into the market upon seeing a wide bar, thinking that it’s a breakout and are frightened that they are losing out on a great trading opportunity. Many times the market pulls back, stopping out these traders who got into the market too soon. This happens in all markets and in all timeframes and is one of the biggest enemies of all traders who jump into the market too early, as the fear of missing out triggers an emotional trade. WideBar indicates extreme price volatility in the market, giving a clear signal to us as traders to sit on the sidelines and stay away from the market for the time being. Indeed, it is important to realize that the WideBar Indicator is not a trading signal to enter the market, but the opposite, and is in fact a warning signal to stay OUT, and wait for the market to either close above the high of the wide bar (in an uptrend) or for it to consolidate within the range of the wide bar and then commence a trend. From a trading perspective, it is important to note that following a wide bar, market price action almost always returns to trade within the range of the bar in the short term. This is where most traders get trapped. We simply wait, and then trade once the market has settled and re-enter with the other Hawkeye Indicators, safely and with confidence. Don’t get trapped with a false breakout, use WideBar!